NB: Post updated 5 July 2014, so the first two comments below refer to a non-working linux and windows version. The sketch is saved to /tmp on linux as an *.rb file prior to running (similar to processing). To get the ide to look right you need a theme, here I stole fjenetts coffee-script theme, blue diamonds would look nice for ruby. You can get the Fukuda-san repo here. For a modified Makefile for linux (not archlinux) see this gist. Possibly it may tempt some processing users (especially Windows users) to dabble with ruby, but I have never been very happy with the editor in the processing ide (and there are other limitations) neverthless kudos to Fukuda-san. I expect to report more experiments soon. Hi monkstone, I am tyfkda. Thank you for watching my experimental project! 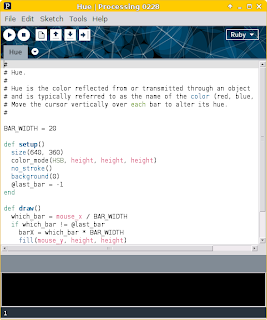 I have updated the code, so Ruby mode is now working on Windows and Linux, too. Sorry for the bad Makefile. I think it is good to be able to use Ruby mode in PDE for programming newbies and non-programmer. I will give it another go, but even non programmers would benefit from a better editor. I guess it might it tempt some newbies to put foot in water but shoes is aiming to do that too. Now working for me I will do some more experimenting (there are 300+ examples distributed with ruby-processing to try out, I guess it won't work with gems though).